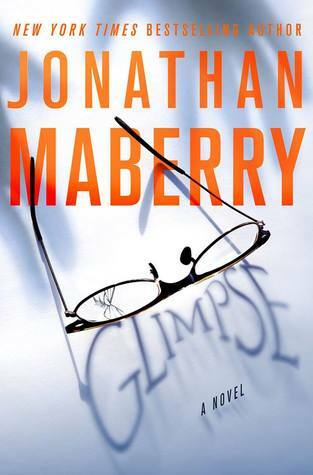 Glimpse is my second book by Jonathan Maberry, and I felt like I was taking a little bit of a chance because several years ago my attempt to read his book Patient Zero did not go so well. However, the premise simply sounded too good, and in the end I’m glad I overcame my hesitation to give this one a try because I really enjoyed it. In addition to being a blend of horror and the paranormal, this chilling story also has an element of otherworldly suspense that I think will make it appeal to fans of Joe Hill or Dean Koontz. Glimpse follows recovering junkie Rain Thomas, a twenty-something young woman who has struggled to overcome tragedy and loss to build a life for herself in New York City. At age sixteen, she became pregnant and was forced to give her child up for adoption after Noah, her first love, was deployed to Iraq and killed in an IED attack before he even found out about the baby. An embarrassment to her upper crust family, Rain was essentially left to fend for herself after she succumbed to her grief and fell into of life of drug addiction. Now three years clean, Rain is trying her best to stay that way, attending her support group meetings and trying to find steady employment. However, on the day of a big job interview, strange and disturbing things start happening around her. First, it was the malevolent presence she felt in the bathroom as she was getting ready that morning, then on the train heading into Brooklyn, an old woman gives Rain a pair of broken reading glasses before vanishing like she was never there. But what shakes Rain to her core is the sight of a little boy she catches through the cracked lens of the borrowed glasses, a boy who looks so much like her dead boyfriend Noah that she can’t help but think she is seeing a vision of the child she gave up almost ten years ago. With terror, Rain also believes she can sometimes recognize another figure in these creepy glimpses through the lens. Known only to her as “Doctor Nine”, he is a cruel and evil man who has been haunting her dreams, and now Rain fears that this creature out of nightmare may have her son. Hands down, my favorite thing about this book was Rain, who was in every way my kind of protagonist—a tragic heroine, to be sure, but also a fighter and a survivor who has managed to pick herself up and out of the darkest time of her life. Maberry did a great job exploring and developing her personality because I found her to be very convincing; she’s just so genuine, so flawed, and so undeniably and deeply human that my heart really went out to her. There’s also a charm about her that I found strangely endearing, an almost protective feeling I developed for her character even though Rain has proven time and time again that she is strong enough to hold her own in the face of the most difficult or terrifying situations. Rain’s past is also complex and well developed, revealed mostly through her intimate confessions at group therapy. These moments were woven seamlessly into the narrative, helping readers grow closer to the protagonist without resorting to awkward and sterile flashbacks to her childhood or teenage years. In fact, these interludes quickly became some of my favorite sections of the novel because of the way they made the story feel much more immediate, even if many of them were heartbreaking to read. I was affected in a way I rarely feel with a lot of horror fiction, and certainly, I felt much more here than I did with the author’s first Joe Ledger book, which mostly just left me feeling disconnected and bored. Glimpse, on the other hand, is a much more elaborate and elegant novel. It’s incredibly atmospheric, for a start, dialing up the creep factor to 11. We also have a fantastic villain in Doctor Nine, who reminds me very much of a Charles Manx-like creature from Joe Hill’s N0S4R2, a predator who is able to slip in and out of a secret world that exists alongside ours in order to stalk his young victims. As well, Glimpse is made up many different components, including the POVs of a handful of other characters besides Rain, plus plenty of snippets from the past that are integrated into the present. There’s also an abstract element involving the bending and twisting of time and reality, which might not come across too clearly at first, but in the end, I was quite happy with how it all came together. On the surface, Glimpse may be billed as a novel of paranormal horror and suspense. But dig a little deeper, and you will also find a tale of redemption and recovery, a story about confronting the demons of the past—both the figurative and literal ones. Simply put, it was a great read, with the plot holding my attention captive from beginning to end. I would love to read more like this from Jonathan Maberry. I think I would like this and any book with a villain called Doctor Nine is always going to grab my attention. I haven’t read this author although I did buy Rot and Ruin and still fancy reading that as it seemed to be such a hit. I’ll look out for this one. I’ll probably have to check out Rot and Ruin too, if it’s one of his hits. I couldn’t get into his Joe Ledger series, but I still want to read his other stuff. This sounds fantastic! I got a surprise copy in the mail but just haven’t had time to read it. It’s definitely going to be a priority now! Some interesting topics there and I confess that I didn’t know about this one. It looks great in any case! I had heard his name being thrown around too, but it was just my bad luck that I started with Patient Zero because I didn’t like that book at all. Admittedly, it put me off from trying him again for years, but I’m so glad I took a leap of faith on this one, because it was brilliant! Nice. I have quite a few Jonathan Maberry books I still need to read. This sounds like a winner, though. I really liked it! I’ve heard from Maberry fans that Glimpse is a lot more complex and is quite a step up from his older stuff. Yeah, the bit about the old woman and her glasses was mentioned in the publisher blurb too, and I confess, it was a big part of why I wanted to read this. 😀 It creeped me out big time too, but in the good way! This is not in me usual genres but the review makes it sound so interesting and fun that I have added it to me list. Thanks matey!